It’s still National Poetry month, but even more importantly (for some) it’s baseball season. 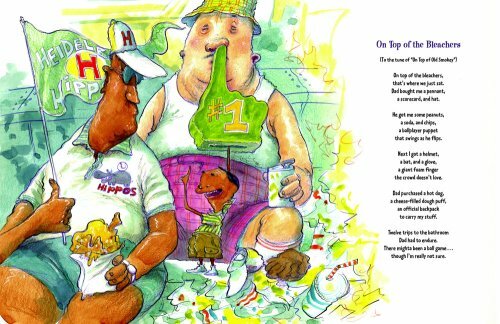 This book will certainly be a hit with sports fanatics as well as those of us who appreciate a good rhyme. From my experience as a bookseller, parents who truly appreciate poetry will pick up a new Alan Katz book and purchase it straight away without even reading it. On the other hand, I had never read one of his books before. I was missing out — H.I.L.A.R.I.O.U.S! Going Going Gone! 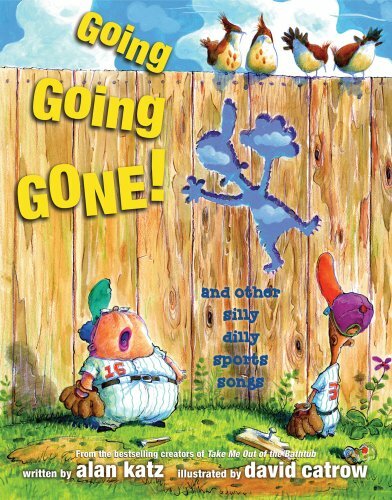 and other silly dilly sports songs is a terrific collection of poems that have been written to match the tunes of many well known songs. The opening “silly dilly” song is titled On Top of the Bleachers and is paired with the the tune of “On Top of Old Smokey”. Alan Katz has managed to capture genuine sporting moments for better or worst. Dad Took Me to Go Fishing, set to “Take Me Out to the Ball Game”, is a a pricless little song about a father son fishing trip. They have no luck catching a fish, so they stop by the store to purchase one that Dad can claim as his own catch when they go home to mom. We’re Choosing Up Sides is set to the tune of “The Wheels on the Bus” and is all about choosing up sides for the basketball team — nobody likes to chosen last. Each illustration by David Catrow is rendered in watercolors, colored pencil, and ink, and complete the over-all appeal of this book by adding an extra dose of over-the-top absurdity that children won’t be able to resist — especially boys. Clever, cool, witty, and very sportive, are just a few words that could be used to describe this book. Be sure to check out the bestselling Take Me Out of the Bathtub by the same clever creators.